When one shares a recipe with a chef, the finished product is usually a delightful surprise. Such was the case for The Early Show's co-anchors. 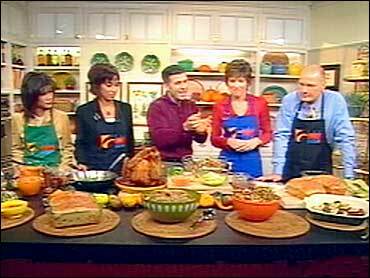 René Syler, Harry Smith, Hannah Storm and Julie Chen shared their favorite Thanksgiving recipes with Napa Valley Chef Michael Chiarello. The author of "Casual Cooking" gave the Turkey Day favorites a bit of a Mediterranean flair. Chiarello says the creation of a favorite food, with a modern spin, does more to enhance the dish than it does to rob it of a familiar flavor. Harry Smith's recipe for mom's raisin bread was transformed into Thanksgiving raisin bread panzanella. Panzanella is an Italian bread salad usually made with onions, tomatoes, basil, olive oil, vinegar and seasonings and chunks of bread. René Syler's recipe for her husband's wild rice/brown rice medley became California Arborio rice for Thanksgiving turkey. Chiarello enhances the dish with agricultural products from the sunshine state: apricots, almonds, Meyer lemons and brown (distinctly nutty flavored) Arborio rice. This new recipe has been adapted to go perfectly with roast turkey. For the recipe Julie Chen got from her mother for pumpkin soup, the chef created butternut squash and apple soup. Chiralleo says the apples balance the sweetness of the squash. He notes that one should cook the leeks, squash and apples together until they caramelize. This is what gives the soup its depth of flavor. Hannah's mushroom-and-sausage stuffing becomes sausage-and-porcini polpetti with cranberry glaze. Polpetti is Italian for meatball. In this case, the sausage meat is mixed with breadcrumbs, sage, caramelized onion, aromatics and then bound with egg yolks. The meat is then lightly dredged in flour, seared, baked and then finished with a de-glaze of cranberry dressing. This dish goes great with roasted turkey, vegetables and soup. You'll need to add 2 cups more of flour after the ingredients are mixed the first time. The finished dough mixture should remain pliable. Once you can't mix with the big spoon anymore, use your hands. Keep the big bowl clean by adding more flour a little bit at a time - you don't want to have any loose flour at the bottom of the bowl. Keep adding flour until the dough is still of a pliable consistency, but not dry. When it's ready it should look like and have the consistency of bread dough, that's when you know you're done. Leave the dough in the bowl and put a little Crisco on top to grease the bread dough. Put a sheet of wax paper over the dough, and then a dampened dish towel on top of that. Place the bread in a warm (not hot) dry place like the inside of a cool oven, with the light on so the dough can rise. Bread should sit for at least 1 hour to 1 1/2 hours. It should rise until it gets quite big. Push it down a little to get some of the bubbles out. Then place the wax paper and dishcloth back on top. Let the dough rise again in the oven or in a dry warm place until it's double in size from what it was in the beginning. Take the risen dough from the bowl and divide it into loaf-sized pieces. Place the dough in greased (with Crisco) baking tins, large enough for 1-pound bread loaves. Put a little more Crisco on the top; wax paper and damp cloth and let the dough rise again for a half hour to 45 minutes (outside the oven). The total length of time needed for the dough to rise will depend on the warmth in the air. Remember, the dough cannot get too warm or too cool. Allow the dough to rise until it has a nice round top. In the meantime, preheat the oven to 350 degrees F.
Bake the breads for 35-minutes at 350 degrees. You'll probably need to experiment with the oven and the pan. Mrs. Smith does not like to bake in glass, she says plain tins (not aluminum). The breads are done when they're a medium brown color on top. Remove immediately from the pan and place on a board to cool. The classic recipe for this famous Tuscan bread salad is best known as a summer offering. The change of the seasons presents the opportunity to use the method for making panzanella as a base recipe but change some of the ingredients to celebrate the bounty. This recipe makes use of raisin bread as the main ingredient. The addition of the other flavors and seasonings is a perfect combination for a bread salad for autumn. In a ten-inch skillet on medium heat, melt 2 tablespoons of the butter and when it turns light golden brown, add the garlic and half of the thyme. Toss until the garlic begins to caramelize, then add the red onion. Adjust the heat so that the onion will sauté slowly and evenly and continue to cook until caramelized. Add the balsamic vinegar and incorporate with the onions. Season with a little salt and black pepper. Puree the onions in a blender until smooth. It may be necessary to add a little warm water to create a thick-sauce-like consistency. Transfer the puree to a mixing bowl then whisk in the olive oil. Adjust seasoning to taste and reserve. In the same, pan melt the remaining butter and when it begins to foam, add the remaining thyme. In a large bowl toss this butter with the raisin bread. Gently mix in the grated Parmesan. Transfer to a baking sheet and toast the croutons until they are golden brown and lightly crisp. Return the croutons to the mixing bowl and toss with the reserved vinaigrette. Mix in the Brussel sprouts, the celery heart, carrot and a half cup of the hazelnuts. Adjust seasoning, then lightly pack the bread salad in a bundt pan and hold for five to ten minutes to create the form. Carefully invert the panzanella onto a serving platter and gently remove the mold. In the same mixing bowl toss the arugula with the hazelnut oil, lemon juice, a pinch of salt and a few turns of fresh cracked black pepper. Mound the arugula in the center of the panzanella. Finish with the remaining hazelnuts on the salad and a grating of Parmesan cheese. Serve immediately. Boil 3 cups of the rice medley in a pot with 6 cups of chicken (or turkey) broth and a tablespoon of olive oil. Cook the rice until it is completely done (brown rice tends to take a little longer than white rice). In the mean ime, lightly sauté the onions and celery in a mixture of olive oil and butter, until they are both clear. Combine the rice, apricots, onions, mushrooms, walnuts and celery in a big mixing bowl and carefully fold the ingredients together. Season with salt, pepper, a little Worcestershire sauce, thyme, and garlic powder. Add a another 1/2 cup of chicken broth to keep the mixture relatively moist. Pour the mixture into a buttered baking dish. Bake for 30-40 minutes covered at 350 degrees. This side dish features many of California's agricultural product s- apricots, almonds, indigenous Meyer lemons and brown Arborio rice. This organic and raw grain has a nutty flavor unlike any other rice. Even though it is Arborio, the unrefined grain is not suitable for making classic risotto and should be cooked as one cooks wild rice: boiled in water or light stock. The cooked rice can be used in many ways and the following method goes perfectly with roast turkey. In a six-quart stock pot, bring to a boil the chicken broth with two quarts of water, the olive oil, carrot, celery, onion and bay leaf. Add one tablespoon of gray sea salt. Add the rice and when the stock returns to a boil, adjust the heat to a simmer. Stir from time to time to keep the rice from sticking to itself and the bottom of the pot. Continue to cook until the rice is tender, about 40 minutes. While the rice is cooking, prepare the mushrooms. In a large skillet, heat 1/3 cup of fat from a roasting turkey (or 1/3 cup olive oil) until is begins to smoke. Carefully add the mushrooms to the pan and spread evenly around the cooking surface. Cook until the mushrooms are caramelized on the bottom, then gently toss in the pan. Add the shallots and thyme and when the shallots become lightly golden, season with salt and pepper. Pour off any residual oil in the pan, then return the pan to the heat. Add the lemon juice then 2/3 cup of the stock the rice is cooking in. Adjust the heat to a simmer, then stir in the cranberries, apricots, almonds and orange zest. Season to taste, then reserve. When the rice is cooked, drain through a sieve, then transfer to a large mixing bowl. Mix with the reserved mushroom mixture. Hold at room temperature until served. If serving with a roasted turkey, remove the turkey from the roasting pan or baking dish and place a foil tent over it. Pour off any remaining fat in the pan. Place the rice mixture around the base of the baking dish (if using a cocorico) or in the roasting pan. Warm in the oven, covered, for about twenty minutes. Present the rice dish as a base in a serving platter or in the cocorico. Place the turkey back on the cocorico and serve. Preheat the oven to 400°F without convection or to 375°F with the convection fan. Wash the turkey inside and out and dry well. Coat inside and out with half of the olive oil. Season the turkey on the outside with two tablespoons of the seasoning salt. Place the rosemary sprigs and lemon inside the cavity of the turkey. Carefully place the turkey onto the cocorico roaster with the legs facing up. Press bird firmly onto cone through the neck cavity. Remove all the oven racks except for one and make sure it is placed on the lowest level. Cover rack with foil and place the cocorico with turkey in the oven in the center of the foil. Turn heat down to 375 degree F without convection or to 350 degree F with convection fan. An hour and a half into roasting, lightly cover top of browning turkey with foil and continue roasting until the internal temperature is 165 degree F (test temperature of turkey next to bone in the thigh). Juices should run clear. Remove from the oven and let rest for fifteen minutes before carving. Carefully remove the turkey from the cocorico and carve into serving portions. This will ensure that the juices stay in the bird. Sauté shallots with cooking oil until soft. Add pumpkin, chicken stock, salt, pepper, ginger, cinnamon. Bring to boil then simmer until pumpkin gets tender. Before serving simmer to the temperature and adjust seasoning according to your taste. Garnish with paprika and a sprig of watercress on top of each bowl. The fresh acidity of fall apples helps balance the sweetness of butternut squash in this creamy autumn soup. You won't have to announce that dinner's ready. The aroma of the spice rub will lure everyone to the kitchen. Notes: Cooking the leeks, squash, and apples until they caramelize gives this soup its depth of flavor. Melt the butter in a large pot over moderate heat and cook until it turns nut brown. Add the leeks and sauté until slightly softened, about 5 minutes. Add the garlic and sauté briefly to release its fragrance. Add the squash and apples, raise the heat to high, and cook, stirring, until the vegetables begin to caramelize, about 5 minutes. Stir in the spice rub and cook briefly to toast it. Add the stock or the broth-water mixture, bring to a simmer, and cover partially. Adjust the heat to maintain a gentle simmer and cook until the squash and apples are tender, about 40 minutes. Transfer in batches to a blender or food processor and blend until smooth. Return to the pot, reheat to serving temperature, and season with salt. Drain and slice mushrooms. Put cooked giblets through food chopper. Add minced onion and parsley to sausage meat in small saucepan. Cover and cook over low flame 10 minutes, stirring occasionally. Cool. Mix bread crumbs, salt, lemon rind and Worcestershire Sauce. Add mushrooms, cold sausage mixture and giblets; mix thoroughly. Add well-beaten eggs. For a more moist stuffing, add 1/3 to 1/2 cup of water or giblet stock. Allow about 1 cup prepared stuffing for each pound of fowl. Meatballs in Italy are called polpetti. They are usually made with beef or veal. The meat is seasoned with aromatics and is served as an entrée in trattorias and simple country restaurants. Refined versions can include other ingredients such as rice, sweetbreads and swiss chard. This recipe takes the master method for making the meatballs and uses ground pork. The addition of dried porcini mushrooms adds another layer of seasonal flavor. Finishing the polpetti with a simple sauce using a cranberry dressing makes this a unique addition to the Thanksgiving table. In a small bowl, pour one cup of hot water over the dried porcini. When they soften, strain then chop fine. Reserve. In a medium skillet, heat two tablespoons of the olive oil then add the onion. Saute until lightly browned then add the garlic. When the garlic begins to caramelize, add the porcini and the sage. Reserve. When the onion mixture is cooled, blend with the ground pork in a mixing bowl. Gently mix in the Worcestershire sauce, lemon zest and parsley. Season with salt and pepper. Mix in the egg, then add the breadcrumbs. Form the mixture into two-inch patties no more than an inch thick. Refrigerate for one hour or overnight, covered. Preheat oven to 250 degree F.
For serving, lightly dredge the patties in the flour. In a large skillet, heat the olive oil until it begins to smoke. Carefully place the patties in the pan and adjust the heat so that they sizzle and caramelize. When the bottoms of each are browned, turn each patty over and continue to cook in the same way. Adjust the heat as necessary for even cooking. Transfer the polpetti to absorbent towels and hold in the oven. Pour any residual oil in the pan, then return the pan to the heat. Add the chicken broth and with a wooden spoon, scrape any bits from the pan surface. Reduce the stock by half. Stir in the cranberry dressing. Adjust the heat to simmer the sauce until just thickened. Place the polpetti on a serving platter then spoon some of the sauce over each. Serve warm.